I have been looking forward to writing this Blog Post! And yes, you read the excerpt correctly – my client for this session (Mark) had only recently returned to fishing following a break of 16 years. It was lure fishing, with bass in particular being the catalyst for him booking a guided session with me, alongside purchasing some very nice equipment from a friend. I’ve said it before, but the reason I ask prospective clients to complete my ‘Client Booking Form’ is so that I can gauge their previous experience, what equipment they may need, and most all, so that I can understand what it is they would like to learn, so that I can cater the session towards their requirements. Mark’s were to learn the basics of modern lure fishing and lure fishing for bass. I meet some very nice people in the course of my guiding and upon meeting Mark it felt like we’d known each other a very long time. I had created a plan for the session that would involve the use of weedless and weightless soft plastics, surface lures and once it became dark – the needlefish. I had also brought along a rod/reel/lures for him to use as he’d stated that he wasn’t quite sure that what he’d bought from his friend was entirely suitable. He needn’t have worried though, as out of his car appeared a practically new 9′ Major Craft Skyroad 10-30g, a very nice 4000 size Shimano reel and a selection of lures that would put most tackle shops to shame – a complete bargain for what he’d paid for it all in my opinion – sorry if you are his friend and reading this! With the flooding tide (a neap at 4.5m Salcombe scale) peaking at 2321 I would concentrate my efforts on introducing ‘how’ to fish the lures and ‘where’ to use them in daylight, whereby he’d have the chance to use his new found skills in and around some of the remotest and roughest ground south Devon has to offer. Additionally, he would have the opportunity to actually stand and inspect the very ground he would later be casting one of my special needlefish lures into. Yes, I bang on about them a lot, but for good reason – they catch a lot of bass. Mark (who resides in the North-West) was on holiday for a week or so therefore, he’d seen some wonderful sights before we’d even met up, but the I think the ruggedness of the coastline we were about to step out onto took his breath away – something I always enjoy witnessing. As we clambered down to the first stretch of reef, I could see at the entrance to a long gully that leads into the open sea, what appeared to be some baitfish scattering. As we walked across the rocks, I explaining to Mark that in the very bright and calm conditions we were experiencing the two ways to approach catching a bass would be to fish something moving quickly across the surface in the current (so to tap into their instinct to hit it before another fish grabs it) or to fish the most naturally looking and swimming lure available. So having seen small fish panicking and larger fish moving around the area, attaching a small surface lure made more sense than a soft plastic. Before we reached the ‘hot spot’ I wanted to ensure Mark could ‘work’ the surface slider in that lovely zigzagging action correctly – something that is like patting your head and rubbing your belly at the same time. It took only a few minutes for Mark to crack it and following a few tweaks to his casting style, within no time at all, the lure was sailing out there and doing its thing perfectly. A couple of swirls behind the lure but no attempts to hit it had me wondering if the culprits were in fact Mullet. And as the tide began to creep in over the rocks, sure enough, their presence became more obvious. A change of lure was required so following a brief demonstration of how an OSP DoLive Stick looks and reacts in the water (to the most subtle movements with the rod) we were some traipsing over the reef again to fish another mark – in the hope we could intercept a bass towards dusk. 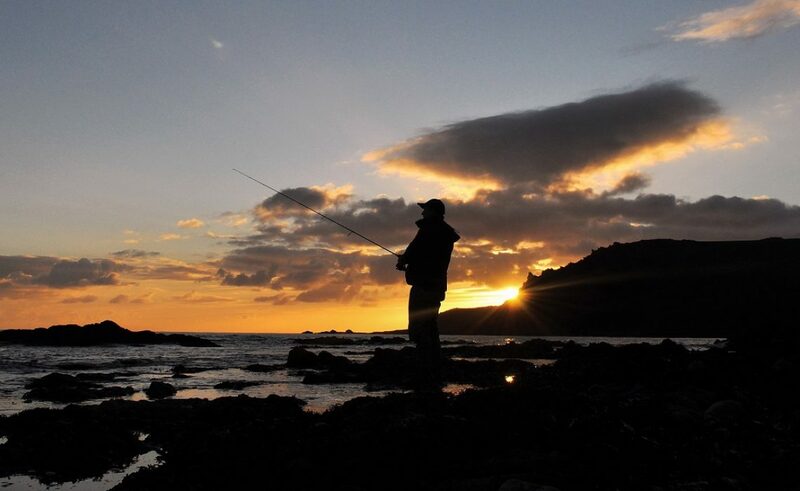 Dusk approaches as Mark slowly retrieves a weedless soft plastic over a rugged south Devon reef system. It was at this juncture that I took the opportunity to highlight a number of features set within the various reef systems (that attract the bass) as we walked over and through them. Whether these zones are natural food gathering areas, ambushing points or purely patrolling areas, or indeed a combination of all of these elements is a fascinating component to learning how to catch bass. It was something that was/is very productive and that he very much enjoyed. 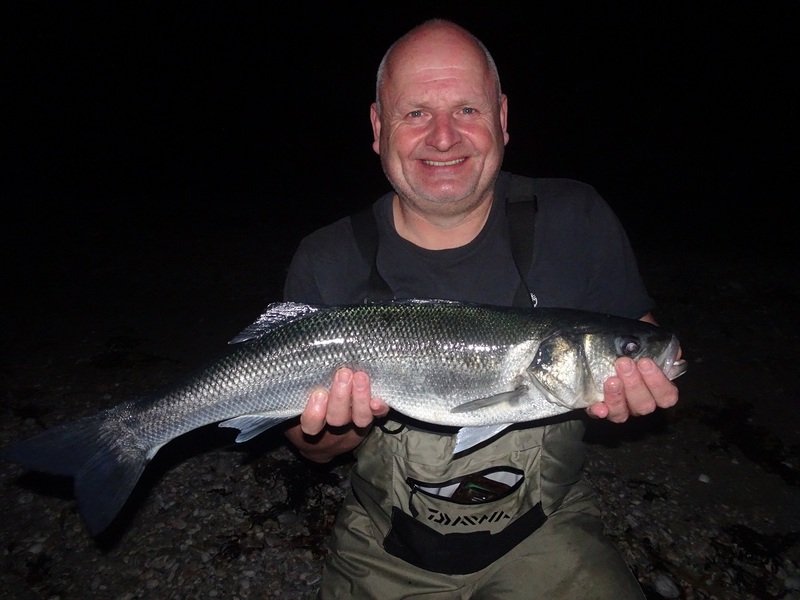 With the tide now pushing strongly into a number of inlets and small bays we set about searching them out one by one – initially with a subtle soft plastic (due to the exceptional water clarity and very shallow water) and then, in areas affected by the strong current, with a surface lure. By this stage, Mark was clearly very comfortable with the equipment he was using and was doing everything ‘right’. Mark blasting a small surface lure out into a strong tidal current. With darkness imminent, and with the sea conditions exceptionally calm and clear I decided to attach a 5″ white Waveworm Bamboo Stick here first of all. With Mark fully briefed on what to do in the event of latching into a fish he set about meticulously casting and retrieving the soft stickbait over the very ground he’d walked over only 2 hours previously. Mark fished ‘hard’ over the next hour or so as we searched out different sections of the reef, with every cast bringing renewed optimism and each subsequent retrieve bring a laugh, a story or a joke – all the time my mind was ticking away though, thinking about what else I could do to make this session a really memorable one for Mark. With the Waveworm and then the usually very reliable Albie Snax having both been given extended periods of water time it was time for a change lure therefore, I introduced the lure of the moment – my ‘salvaged and battered’ Silver Jim’s Lures Needlefish (aka the silver bullet!). I’d commented to Mark that the cove we were fishing can completely change once the tide begins to ebb, and as high water came and went the final hour of the session was likely to offer him his best chance. We were now 30 minutes into the ebb and Mark had been fishing with the needlefish for around 10 minutes therefore, I turned to crunched the 30 metres along the beach to grab a drink from my bag, when I actually heard the sound of his Major Craft rod ‘flex’ as something completely ‘nailed’ the lure a good 40m out. Wow! A serious amount of line was instantly and positively being yanked from the drag as the rod remained right over with Mark hanging on for dear life! This bass took at least 8m of line on that first run before Mark could even start thinking about landing it. “Remember mate, keep the pressure on it, but not too much and if the line goes slack wind very quickly” I said, about as calmly as I could which was difficult under the circumstances! We heard the fish thrashing on the surface and with that I duly switched on my trusty headtorch – the fish was still a very long way out though. Mark had caught some very nice fish on bait prior to his extended break from fishing (he also told me a story about a big bass, that he estimated to be around 7lb that he’d lost too) therefore, this wasn’t completely alien to him. He was doing a brilliant job of battling this bass that just didn’t want come in and I was praying it wouldn’t come off (as many do). With the fish skating initially to the left and then the right, I was gradually becoming more confident of the hook hold and our chances of landing what I expecting would be a very decent bass, and with that she appeared in the beam – oh yes! “Lower the rod to your right Mark” I said and with that the bass made a strong parallel run along the beach. What a wonderful sight, and one you relive in your head afterwards – even as a guide let alone as the angler actually attached to it! The hook hold was about as secure as it gets – right in the scissors and on the Size 2 treble positioned in the centre of the lure (as you can see above). A very, very nice bass by anyone’s standards. Well done and congratulations to Mark on hooking and landing such a lovely fish. She was slender and not especially fat and I quickly pulled my measuring tape out of the front pocket of my waders and proceeded to wave the flies away from my face – 68cm! This was not only a PB for Mark, but the first fish he had ever caught on a lure – what a way to start and a ‘dream come true’ as Mark put it. Thank goodness I’ve got used to my new camera, in addition to gradually becoming more adept at capturing a decent photograph in the dark as it’s a shame not to do these moments justice. ‘Man Hugs’ (of course) ensued following the successful release of Mark’s bass whereby, once we’d both recovered from the ‘excitement shakes’ he continued to fish – would an even bigger one take the lure? Unfortunately, within a couple of minutes Mark snagged the reef and despite trying everything I could to free it, the leader eventually gave way. With Mark extremely apologetic, I reassured him by way of telling him that it was highly likely I’d be able to recover it the next time I walked this reef – something that 3 days later I was indeed able to do! What a session and what a fish! To take someone who is completely new to this style of fishing, show them ‘where and how’ and then to witness them catching a bass like this is off the scale in regards to levels of satisfaction – I love my job! I booked a session with Marc on the 5th July 2018. Marc stayed in touch from the time of booking to the session itself even re-arranging the venue to suit the conditions. I’ve not used a guide before but Marc’s website and professionalism secured my booking. The session itself was a revelation, we walked the venue in the light and Marc pointed out the holding spots and when he expected them to fish and then went through the lures. There were a lot of mullet around during the light with little signs of Bass and Marc primed me to expect action as it went dark. How right he was , I hooked one and lost it and thought my chance was gone and then right after high water I was nailed by a real beastie, a hooped rod and screaming reel followed, then the sight of easily the biggest Bass i’d ever hooked on its side waiting to be landed, the pictures are on the blog and what a fantastic time I had. I learned more about Bass fishing in that session than I would have believed. All I can say is believe what you read in the blog .Marc is patient, enthusiastic and an excellent guide and if you are serious about learning how to lure fish for Bass a session with Marc is essential. Don’t hesitate, book him he’s that good! Can’t wait to get down to South Devon again. Thanks Marc Cowling. Previous My Recent Catches – Little and Large!